I did some research on Twitter contests by pulling the most engaging tweets from Twitter accounts for more than 12,000 companies for the month of January. There was a lot to learn from these tweets: Fashion is big. Sports & music can really get people going. But the #1 way to get engagement on Twitter was a simple “Follow and Tweet to Win” contest. I looked at the top 100 tweets based on engagement rate. What is engagement rate, you ask? At Rival IQ we believe engagement rate as the best way to determine which are the most highly engaging tweets. Engagement rate is sum of RTs and Favorites divided by the number of followers [ (Retweets+Favorites)/Followers ]. This rate enables you to effectively compare the engagement of tweets from companies with drastically different follower counts. For this analysis, the companies we looked at had to have at least 5000 followers to be considered as part of the analysis. What Type of Contests Work on Twitter? The actual prize that was offered in the contests we studied seemed to vary greatly. They ranged from makeup to office supplies, from fish to football tickets (which were especially popular around the playoffs). Almost all of the contests required a simple follow and retweet to be entered. A few were looking for a creative answer to a question or completion of a hashtag. 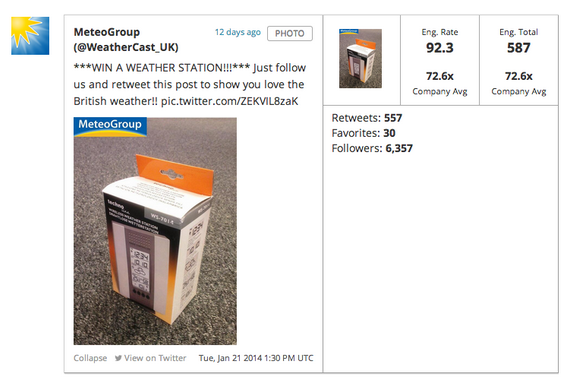 Even the weather can be used as contest fodder, as shown in this creative giveaway from the MeteoGroup in the UK. Will a Twitter Contest Work for You? Maybe. I’m not in the contest business, I’m in the social contest competitive intelligence business. But, if 71% of the top brand tweets are related to contests, AND it’s very easy to launch a contest on Twitter, it certainly seems worth trying, right? Have you ever run a Twitter contest? How did it work for you?